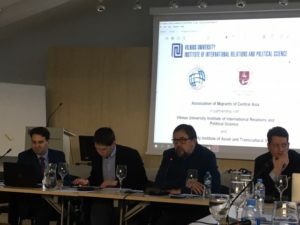 On the 12th of February, the Association of Migrants of Central Asia in partnership with Vilnius University Centre of Oriental Studies and Vilnius University Institute of International Relations and Political Science organized an international roundtable on the topic of Reforms, Repression, Radicalization in Central Asia.The round table aimed to foster dialogue between scholars and policy-makers and was attended by local politicians, scholars and students interested in the politics of post-Soviet states and Central Asia. The round table brought together prominent NGOs, human rights defenders, political exiles, journalists and scholars working on the region. Steve Swerdlow from Human Rights Watch reflected on reforms undertaken in Uzbekistan since the tenure of President Shavkat Mirziyoyev. The focus was on the human rights situation in Uzbekistan, as well as the government’s ambitious reform plans. Despite welcoming, the progress made in human rights, such as the release of political prisoners, the banning of forced cotton picking and the opening up of space for civil society and media, Swerdlow was cautious, noting that the Uzbek government remains highly authoritarian with political pluralism limited and controlled by state authorities. 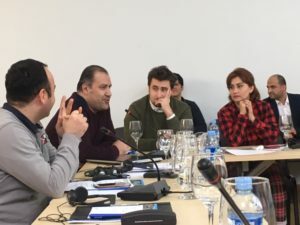 Similarly, Daniil Kislov from Fergana News Agency added that the Uzbek government’s reform efforts face challenges as there are few well-trained officials capable of implementing Presidential reforms. Additionally, many local officials still bear the mentality of decades of authoritarian rule under Karimov’s regime. Marius Fossum, the Norwegian Helsinki Committee’s Regional Representative in Central Asia, presented an alarming picture of the deteriorating situation of human rights in Tajikistan. He highlighted the arrests and detentions of prominent journalist and lawyers as well as anyone critical of the current regime. The authorities have further targeted members of the IRPT opposition party both inside and beyond the country’s territorial borders, and seeking their extradition to Tajikistan. This discussion was followed by personal testimonies of political exiles activists from Tajikistan. Shabnam Khudoydodova told the audience how the Tajik government put pressure on her family members back home, as well as the difficulties of starting a new life in Europe for many exiled activists. The event also featured discussion of the potential threats of radicalism and terrorism from Central Asia. Saipira Furstenberg, from University of Oxford Brookes/University of Exeter, shared her views on the Islamic threat from Central Asia. According to her, the threat of terrorism in Central Asia has often been manipulated and exaggerated by state actors in order to pursue strategic domestic policies and increase the regime’s legitimacy. What has been labelled as a ‘terrorist attack’ in the region, in reality has often been linked to local and political grievances rather than to transnational Islamist movements. She urged policy makers and scholars to unpack regional interpretations and discourses related to the word ‘terrorism’ and its meaning. Muhiddin Kabiri, Leader of the Islamic Renaissance Party in Tajikistan, supported her arguments by reflecting on the government’s narrative on terrorism in Tajikistan and the branding of opposition parties such IRPT as “terrorist”. He further discussed the Islamisation of radicalism in Central Asia, in which religious radicalisation of Islam plays very little role. Fabio Belafatti, Coordinator of the Center of Oriental Studies at Vilnius University, discussed regime survival in Central Asia by highlighting practices of patrimonial regimes in the age of globalisation. In his presentation, Fabio, pointed out on the embeddedness of Central Asian states in global networks that enable the regimes to conflate internal and external security threats. The presentation, focused on the role of offshore financial centres, international power brokers and agencies facilitating the proliferation of authoritarian governance. The round table constituted an interdisciplinary dialogue derived from expert opinion and macro-political analysis. The event followed up with questions from the audience focusing on the policy recommendations for advancing human rights in Central Asia.